Sierra Concrete Resurfacing services the El Dorado Hills and surrounding areas offering decorative concrete resurfacing. If you have old or new concrete that you would like to improve the look of then you should consider seeing what Sierra Concrete Resurfacing has to offer. Specialists in residential and commercial concrete resurfacing they can repair and refinish or resurface your patio, driveway, pool deck, industrial or residential concrete floor. Decorative Concrete Applications – Sundek Classic texture, concrete staining, stamped concrete overlays, epoxy floor coatings, polyurea polyaspartic are a few of the concrete systems offered. Sundek Classic Texture is an excellent acrylic cement coating that can be installed on any concrete surface. The product is sprayed and then troweled to leave a smooth finish. Designs, stencils and colors can be used in a variety of ways to achieve many unique looks. If your looking for pool deck resurfacing the classic texture is a very popular surface because it is smooth, slip resistant, easy to clean and is cooler than regular concrete. Stamped Overlays - Looking to install pavers, natural stone, brick or other natural surfaces but would like a more affordable option. Stamped concrete overlays can be put on top of old or new concrete and an impression of your choice of pattern is then stamped and imprinted into the concrete surface. After the stamping process has been applied to the cement surface it is time to let the decorative application dry which is about the time it is colored and then sealed for durability leaving a unique beautiful look. Concrete Staining - If you have a concrete floor that you would like to improve the look of and make it very easy to clean than this might be the product for you. There are two kinds of stains, acid stain and water-based staining solutions. Acid stained concrete will look very unique almost a one of a kind look where as water-based stains are easier to control the look of and keep a consistent surface. 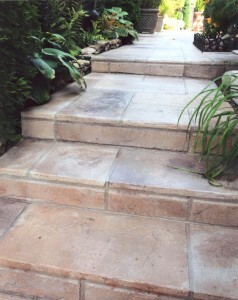 A micro topping can also be applied before the staining process if the concrete is in bad condition. Check out our gallery to view photos! Epoxy Flooring & Polyurea Polyaspartic Systems - Both of these cement systems are great for locker rooms & garage floors. The surface is very durable, easy to clean and can mimic the look of granite or terrazzo. If your looking to resurface, repair or refinish your concrete floor, patio, driveway, pool deck or front entryway, give Sierra Concrete Resurfacing a call today for a FREE design consultation and estimate!